"These women don't have a clue...I'd like to see them be able to get pregnant and have to feel what it's like to carry all of this weight around in THEIR belly..."
On a side note...several months(?) ago on Drawn.ca (a great site if you've never visited)gave a shout to a project that is going on called 700 Mole-Men...on this site is a listing of names and brief descriptions of characters and it seemed like such an awesome idea that I decided to throw my hat in the ring as it were...most people have tended to do fairly quick drawings but there are a lot of great images...I'm too stupid to do small so I'm working on a 15x20 piece of illustration board...plus I haven't done anything serious with graphite since my wiener dog pic...Check out the site and give it a shot!!! The list alone is worth reading for grins. 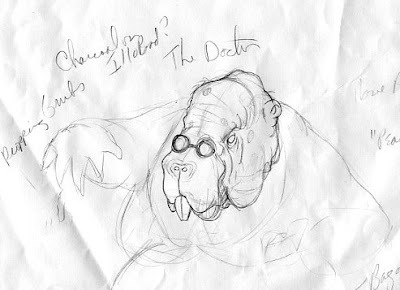 I chose "Doc Minceworm...a fraud"...I figured he is a bit of a snake-oil salesman and envisioned him as someone that would literally rob his patients blind...so that is the direction I am going. I also am trying to incorporate all of the elements and principles of design into the drawing (except color of course) as a test run for a possible project idea. The only bad part is going to be once I've shaded it all I am going to have to go back and adjust all of the values to help make sure the form and texture really pop...I've been careful to have a sheet of paper under my hand to keep from smudging but as areas get completed it is fairly obvious that spots are too light to really work at this point. Brian - I myself have been told in the past that my belly was expanding at such a size that I would be giving birth....to a 5 gallon keg of beer. 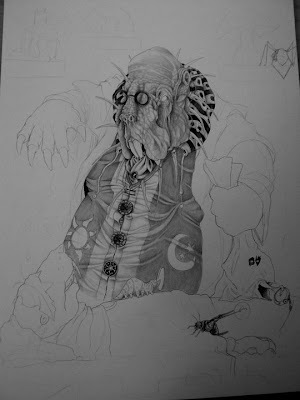 Anyway the moleman is coming along brilliantly!!! Can't wait to see the finished product. Great work on both pieces Brian. I do remember the 700 hobos that I think led to the 700 mole men. Those were funny but it did seem like people were just making a lot of sketches for it. Your piece is just awesome. birth to a 5 gallon keg of beer. arrggggghhhh....yummmm!!! We have a new seahorse exhibit opening soon at The Monterey Bay Aquarium. Supposed to be a good one! I like how you give equal rights to the dads in the post! Whoa, the drawing in progress is amazing!! I need to find the time to do a nice detailed piece. Those were the days. I can't wait to see the end result. He's fantastic! Superb work once again Brian! You are really on a roll this year! Yes, I have read about this project - looks interesting. Glad you're taking a shot at it - looking forward to the end results (and thanks for showing us your process once again). Brian, your eye for detail is superb! You've heard it before, but I've gotta say it! You are fabulous! I like your take on the IF words. Not so literal, with a twist of good humor. First... that is just too funny... and then I scroll down and... Wow! this is some incredible work!!! I can't wait to see the finished piece. Bravo Brian! 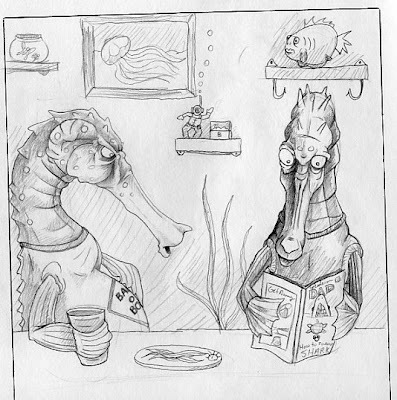 Those seahorses are a hoot and your illustration in progress is AMAZING!! Can't wait to see it finished. 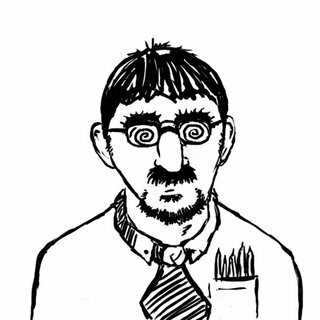 Brian, I really like the way you twist normal, human environments to have them fit in with your anthropomorphs. The details (like the "baby on board" shirt) are always spot-on. As for the Mole-Man piece, I greatly anticipate the final outcome. So far, the details on the face look incredible. Hey Brian...you won my raven envelope!! Also, one of my cards will be enclosed in it so pick out a fave of my images and I'll print up a card for you! 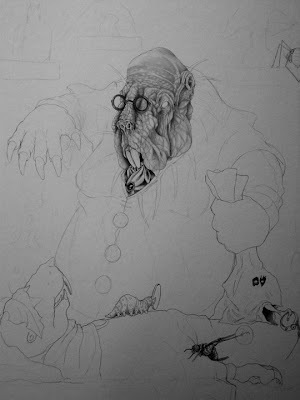 Does the walrus pen and ink have a title? ku ku kachoo. lol - at that sea horse cartoon. can't remember where I saw the show on that; discovery channel... that is exactly what I thought too; those females have it made. It has been a while since I have logged into my blogger...so of course I had to wander to your page! And I find the moleman! Looking forward to seeing the final piece...minus the gross centipede that gives me the heebeejeebies!